As some of you are aware my partner, Nathan, has a preoccupation with the apocalypse. He loves planning our future homestead, which will be self-sufficient, off the grid and include enough resources to survive anything from a zombie attack to a nuclear explosion. He likes camping because it's a chance to practice his survival skills, and most of his marathon training is completed with the idea that a person who can run 26.2 miles has a better chance of making it through most end of the world scenarios. Part of his preparation is collecting and reading books on different survival-related subjects. Homesteading, food growing, nuclear survival handbooks - you know, the usual. When I was at the American Library Association's annual conference two years ago, I picked up a postcard for Possum Living and gave it to him, because it seemed right up his alley. He bought the book, read it and then handed it to me. 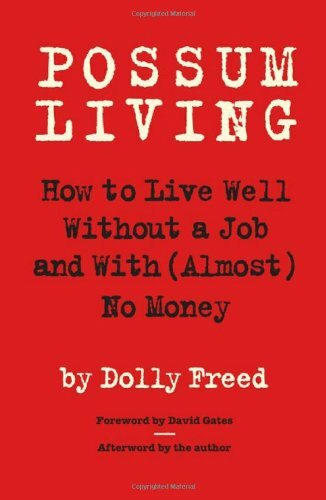 And because I liked the tagline - "How to Live Well Without a Job and With (Almost) No Money" - I read it, too. 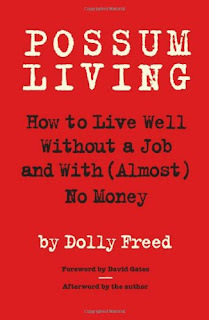 Possum Living was published in 1978, written by Dolly Freed when she was 17 years old. It is part memoir, part instructional manual, part inspiration and wholly narrated in Dolly's easy going and self-assured voice. Basically, she and her father live in a house they purchased with cash (no mortgage! ), eat food they raise and grow themselves (bunnies and chickens in the basement and yard, fishing whenever they want, and a substantial garden on their property), purchase all their clothes second hand, brew their own alcohol, get around on bikes or borrowed horses and sometimes bend the rules to get what they need without actually spending any money. "It's easier to learn to do without some of the things money can buy than to earn the money to buy them." I love this, and ever since reading Possum Living it's become a sort of mantra. Now, I'm not a lazy person. I'm very ambitious and motivated - when it comes to things I'm passionate about. Writing, reading, running, yoga, feminism, activism, animals, community. When it comes to my actual 9-5 desk job? Not so much. I would love to quit my job and focus full time on the things that really excite me, and I'm working towards that reality. I know that when it happens I'll be making a lot less money than I'm currently earning. Which is a scary thought - no one wants to feel like they're going backwards! This is part of the reason I'm drawn to minimalism, anti-consumerism and living simply - I'm training myself to not only live with less, but to thrive because of it. Just as Nathan prepares for the end of the world, I am preparing for the end of this way of living and the beginning of something better. Freedom. While I probably won't make the recipes that Dolly provides or live exactly the life she advocates, I will strive to approach living with the gusto and courage that fills her book. If you're looking for a quick and easy read that will get you fired up, then Possum Living is it!